Cubs voice Pat Hughes, the longest-serving radio play-by-play voice in Cubs history, will emcee the event. Two Hall of Famers are headliners — the Cubs’ Fergie Jenkins and the ageless Marv Levy, only NFL coach to take his team to four straight Super Bowls. All-time Chicago Bull Bob Love will be in the house. Lending some glamour to the party will be Victoria Arlen, the youngest talent ever hired by ESPN. Arlen is a former “Dancing with the Stars” contestant and model, and a gold medalist in ParaOlympics swimming competition. A 2008 U.S. Olympic volleyball gold medalist, Scott Touzinsky, and former Chicago Sky player Imani-McGee Stafford will be on hand to describe what it’s like to go to work via the vertical leap. 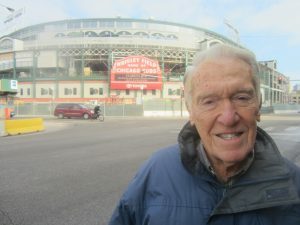 Former New York Mets catchers Barry Lyons and Ed Hearn likely will be asked by me to pay their team’s long-standing debt to the Cubs and Jenkins from 1969. And if you have aches and pains, comeback-facilitator Dr. Richard Lehman, a top sports orthopedist, will be on hand to dispense his wisdom. After Hughes, all of the above are profiled in “Comebacks,” my 15th book. The Cubs have a big representation with Prior, Kyle Schwarber and former North Siders Rich Hill, Chris Krug, Tom Gamboa and Casey McGehee. 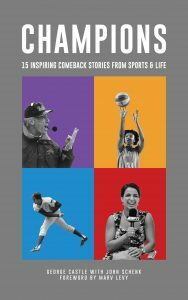 Still more comeback stories are told in the book through the experiences of Thomas “Hollywood” Henderson, a former star Dallas Cowboys linebacker, and Moran Samuel, a female Israeli basketball player-turned-disabled medalist rower. Common theme for all was not giving up. Schwarber was the classic case. Severe knee injuries in the third game of the 2016 season seemed to shelve the then-husky slugger until 2017. But with vastly improved workout facilities in the new Cubs clubhouse, the support of his teammates and their admonition there’s no crying in baseball, Schwarber rehabbed well enough to serve as DH in the Cleveland games of the Cubs’ World Series triumph. In a true Fall Classic that came down to the final out, Schwarber’s bat made a big difference. Kudos go to Dr. David Fletcher, president of the Chicago Baseball Museum, for running interference to chat with Schwarber in Urbana, Ill. early in 2017 for that chapter. Krug is an uncredited comebacker, from way back. 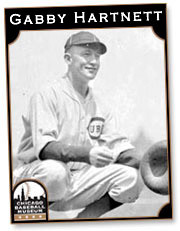 The journeyman catcher ran afoul of new manager Leo Durocher in 1966 when The Lip thought Krug was fraternizing with the then-wife of Bill Wrigley, son of the Cubs owner. Krug was banished from the organization. 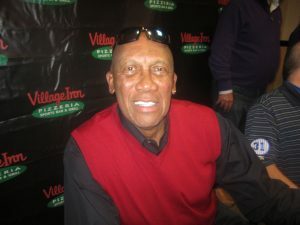 But two decades later, he built the famed Field of Dreams in Iowa while hobnobbing with Kevin Costner on the movie set. Durocher was in tortured retirement in Palm Springs at the time. The night also will be a chance to preview an upcoming book I’m doing with Jenkins on the 1969 Cubs on their 50th anniversary. Everyone knows the alternately uplifting, then depressing narrative of that landmark, franchise-altering season. The challenge for Fergie and me is to tell “why” and explain how the modern Cubs were born out of that feast-and-famine journey. So don’t sit at home as the winter doldrums prevail. Drop by and get some stimulation if you need to craft your own comeback effort. Hopefully, we’ll see you at Osteria Via Stato.